These wedding day bag charms are the perfect wedding accessories. They are lovely wedding day thank you gifts or unusual bridal accessories. 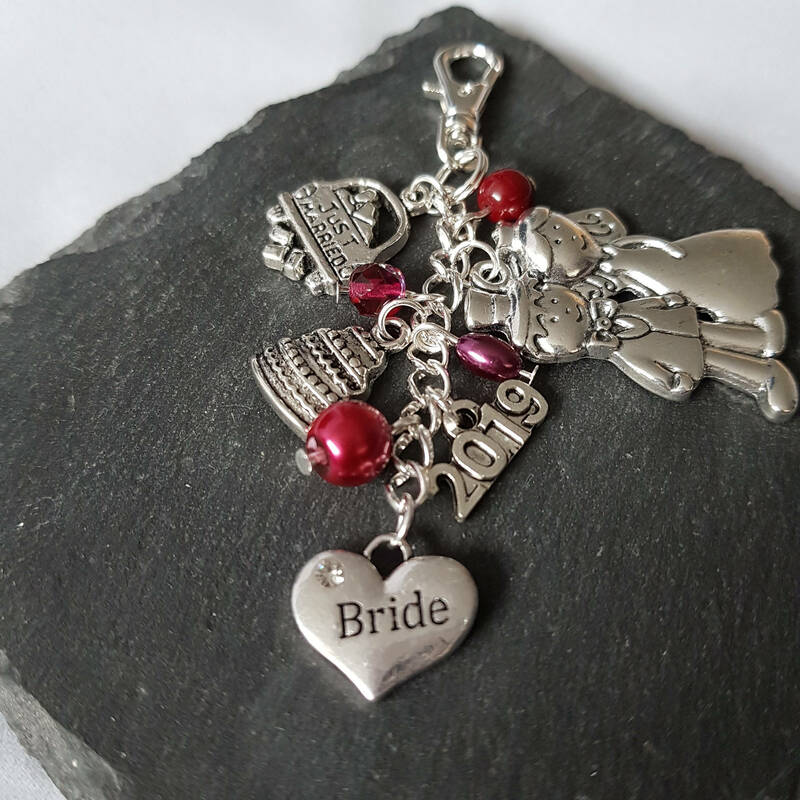 If you are looking for bridal party gifts the set includes gift charms for a bride, bridesmaids, flower girl, chief bridesmaid, matron of honour (honor), mother of the bride and mother of the groom. They also make great wedding favours. 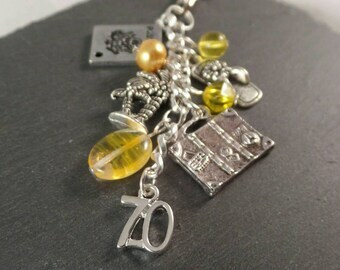 The charms attach to a bag or purse or zip. Each charm has five silver coloured charms. Choose from: bride figure, bells, wedding cake, 2018, 2019, just married, large bride and groom, champagne glass, bouquet and a word charm which can be either bride, bridesmaid, chief bridesmaid, flower girl, matron of honour, matron of honor, mother of the bride or mother of the groom. 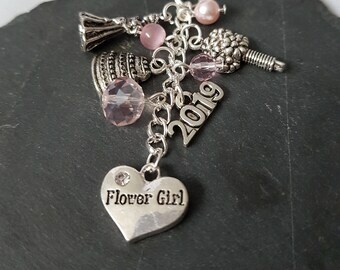 See the picture for the range of charms available and let me know your selection in the comments at checkout. The charm can be customised with different coloured beads to match your colour scheme or preference. See the last picture for some suggested colour schemes. Please note, the pictures are a guide and exact beads may vary. The length of the charm is approximately 9.5cm ( 3.75 inches ). Bulk buys are available at a discount. Please specify bag charms you require and which charms you require on each bag charm. Each bag charm has five individual charms. E.g. charm 1 - bride heart, bride figure, just married, 2018, bells; charm 2 - mother of the bride heart, bells, cake, 2018, bride & groom, charms 3, 4 & 5 all the same - bridesmaid heart, cake, bells, bride figure, just married.